It seemed to me that there was scant coverage in the UK on the critical situation emerging in Kurdistan. This was a surprise given its global importance and that independence referenda are a current ‘zeitgeist’ issue (Brexit, Scotland, Catalonia, etc ). By contrast, here we were, in Kurdistan, post referendum as part of the UK election monitoring delegation saturated in news, digital media and surrounded by people of all nationalities intensely absorbed and totally preoccupied with every twist, turn and nuance of this moment of political and social history. My companions, other delegation members, were a mix of MPs, MEPs, Peers, political analysts, trade unionists, Kurds, reporters, and more. A substantial number from around the world were evidently deployed across Kurdistan to ‘monitor’ the referendum to see if it was free and fair. Our League of Kurdish Nations delegation comprised 18 people. It’s an often overused hyperbole, but this really was the ‘trip of a lifetime’. Not just for the obvious thrill of discovering a captivating country – Kurdistan is mesmerising – but the immersion into the referendum was like nothing else I have ever experienced, nor frankly, do I expect to again. We were divided into several teams in order to cover as many polling stations and areas as possible. My own team, which included seasoned political activists that know election process inside out, spent an arduously long day observing 6 polling stations and monitoring the close of the vote and the beginning of the count on 25th September. We were a formally accredited group, registered and carrying credentials. We were assigned a protocol car* and driver, a polling station list and after that we were absolutely free to go as we pleased. We joked Python-style “no one expects the independent monitoring team”. Nor did they. Our arrival at each station was unannounced. We swept in. Of course we were looking for obvious signs of a well run polling station, no coercion of people, a regular and systematic process, an adherence to key polling principles and conformity across the piece. This we found. With regard to unfettered participation of citizens we noted, women with children, young and old, refugees, Yazides, Muslims, Turkmen and Christian’s. Kurds leave you in no doubt of their pride of being peaceful and inclusive. They are proud of their religious tolerance and inclusivity. At the IDP polling stations (displaced person camps – there are 240,000 refugees in Kurdistan in 52 camps, 41 are from Iraq and the rest are from elsewhere in the Middle East) we came across those people who have refugee status, mainly from the camps of Mosul. These polling stations were overwhelmed. Demand had not been adequately calculated, resulting in far, far too few staff to cope. This meant that what had started as optimistic and patient queues were becoming increasingly fractious in the face of 5-6 hour wait in the slowly snaking queues. A late afternoon decision to extend polling station hours was wise. As far as I’m aware all those that wanted to vote and who were registered to vote, voted. As a substitute delegation for the UN, who could not facilitate this unrecognised referendum, we enjoyed unprecedented political access. We were invited to all the key forums and meetings with High Commission, Electoral Commission and the Governor of Erbil. I met with and questioned Hushar Suwaley of the KDP and the Head of the foreign relations bureau for the PUK. I also met and questioned members of the KRG (A Turkman MP Dr Mohammedali Yaseen Taha ) and KRG staff member Rezan Kader currently ‘acting’ as Consulate equivalent. We even had an opportunity to meet with the Bazarni foundation which provides support to 17,000 orphans among other amazing work. A mix of formal and seemingly informal gatherings gave adequate opportunity to share observations and ask occasionally thorny questions. What are the Thorny questions? Was this a ‘proper’ referendum? Well, no. Under the control of Iraq, at odds with the will of the Iranians and clearly incurring the wrath of Turkey’s Erdogan, it was ‘all but’ a legitimate referendum. Well conducted, sincere and overwhelmingly precise in its outcome. 93% of the vote, some 72% of the population voted ‘yes’ to independence. However the legal status of such a quasi legal process is analysed it cannot be dismissed. The will of the people is clear. Will Turkey now cut off its nose to spite its face? The threat to starve the Kurds by withholding £8-10 Billion of trade from Turkey to Kurdistan seems at best ill thought though as its this line of business and trade, including facilitation of the lucrative oil pipeline which feeds Ceyhan 550,000 barrels of oil per day the KRG’s main source of income. But clearly also revenue stream for Turkey. Iraq’s threats to close down air space have manifested with Erbil and Sulaimaniya closed. But for how long? Meanwhile UKs Foreign policy is a joker card in Boris Johnson’s clumsy hands. Those of us that support the Kurds, both politically and emotionally – because it feels like the right thing, must do what we can do to apply political pressure. *’protocol’ was the support team put into place to facilitate our fact finding. 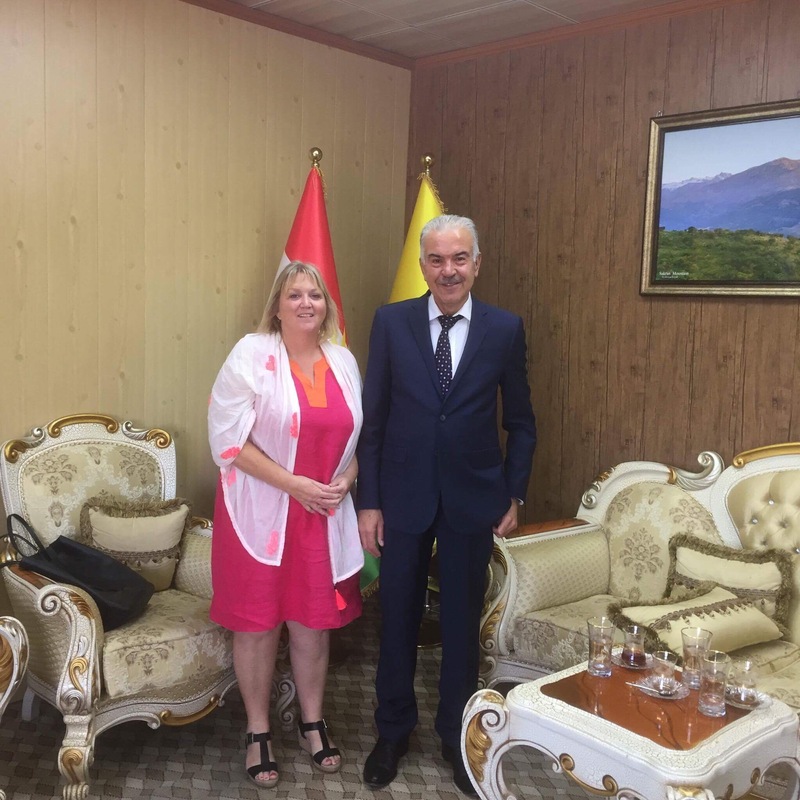 Karen is a Labour Councillor and was in Kurdistan for the elections. Posted on October 7, 2017 by The AvengerPosted in PoliticsTagged Catalan, Catalonian, councillor, democracy, illegal, Iraq, Kurdistan, labour, legal, oppression, Politics, referendum, turkey.